MyPath Savings is a tested banking and savings model that seamlessly integrates key financial capability components into youth workforce programs, including: direct deposit, vetted youth­‐owned financial products (a checking and restricted savings account), a blended in-person and online financial education curriculum, and saving incentives. Youth participants are supported to open accounts, set a personal savings goal, set up direct deposit, use auto-split to save a designated portion of each paycheck, and incentives to meet their goal. MyPath provides workforce programs with the training and technical assistance they need to integrate these components into their existing program cycles. MyPath Savings is the only tested youth financial capability program in the country with demonstrated outcomes, including savings behaviors, positive future orientation and self-efficacy. Since 2011, MyPath Savings has generated over $3,445,191 in youth savings. 85% of MyPath Savings participants open savings and checking accounts; and 75% meet their personal savings goal– on average saving 30% of their income. MyPath Savings builds saving muscles, converting non-savers into savers. With two-thirds of participants reporting they don’t save at the start of the program, a remarkable 80% are saving after the program. 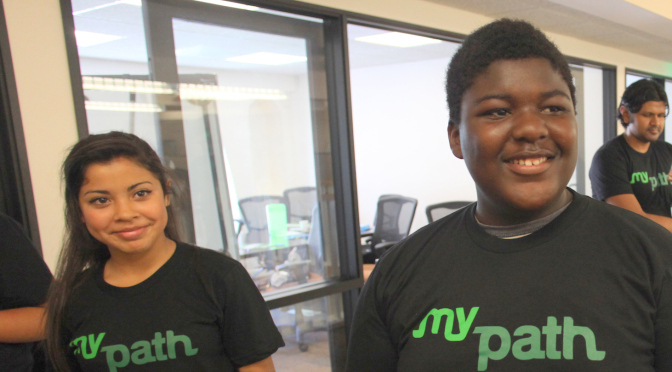 MyPath Savings has served 6,500+ youth. MyPath Savings has been implemented successfully in 14 cities. Longer-term outcomes include: youth gain confidence to continue to budget, save and spend wisely; are more likely to attend college; have an emergency fund established; and are setting and meeting new personal goals through financial planning. MyPath Savings innovation and impact have been highlighted by numerous field leaders, including the Corporation for Enterprise Development (CFED), the Center for Financial Services Innovation, the Consumer Financial Protection Bureau and the Federal Reserve Bank of San Francisco. Youth Workforce Partners: Boys and Girls Club of Truckee Meadows ● Children’s Cabinet ● Clark County Human Resources ● Community Chest ● Community Services Agency ● Goodwill Southern Nevada ● Nevada Partners Inc. If you are interested in learning more about our MyPath Savings model, please contact our Strategic Growth Lead, Catherine Dhongade, at Catherine@MyPathUS.org.